Happy Monday! We just returned home from a family vacation to Lake Powell and It’s one of my very favorite destinations to spend time with my family! If you’ve never been to Lake Powell or seen a photo, it’s the most beautiful lake that’s completely surrounded by towering red rock cliffs in the heart of the Arizona/Utah deserts. We have so much fun spending a week out on the water playing in the sun, but seriously, my skin gets SO dry (especially my shoulders and legs). Recently, I’ve been using the Perlier products each time after I shower or take a bath and I can’t believe what it’s done for my skin! My skin feels hydrated again and so smooth every time I use it (even Drew noticed, which is a big deal ;). First, I use the Honey Body Tightening Gel after I shave my legs and soap up. I love this stuff because it gets all of my dead skin off, smells amazing and my skin feels brand knew after using it! It’s perfect when I’m peeling from a sunburn too, it gets all the flaky skin right off! (I apply this with a loofah). Once I’m dried off and out of the bath, I apply the Honey Revitalizing Body Butter all over from my body from the neck down. It’s a thicker formula and way more hydrating to my skin than a typical body lotion BUT it’s not oily! Next, I use the Honey After Bath Body Water. I don’t use this everyday but always do if I’m wearing a dress or a skirt because it gives my skin a really pretty sheen to it, that’s super natural looking. (Here I’m wearing both the Body butter and the Body water together, and you can see what I mean by the sheen). I let the body butter and body water soak into my skin while I do my hair and makeup and then I finish off with the Honey and Mint Hand Cream. I love this stuff because my hands tend to get super dry. I’ve had minor eczema on my hands from the time I was little and although it’s gotten better with age, I’ve found I need to use a hand cream daily to keep my hands soft. If you have any questions about any of these products or my skin routine, you can leave them in the comment box below. Also, recieve 25% off any of the Perlier products by using the code: rachel25. Thanks to Perlier for sponsoring this post. I did not know this skin care line Thanks for sharing ! I like your routine! The photos are beautiful!!! Love this post, thanks for sharing! I love your hair in a bun too! So pretty! Thanks for your comment. Because of my blog, I’m lucky enough to be able to test out hundreds of different products. I don’t post anything that I haven’t tried and loved. There are a lot of behind the scenes that my readers don’t see. While it may look to you like I post about every product out there, I’ve turned down way more brands and products than I’ve posted because either I don’t like it or the brand doesn’t fit with me or my reader. There’s thousands and thousands of different skin products out there and I think it’s okay to love more than one. Hopefully this gives you better insight as to why I choose to talk about Perlier. If it gets the dry skin off from a peeling sunburn, count me in! That bath cart is fanstastic! I love it! I’m definitely going to have to try these products. My skin gets so dry from sunscreen and self tanner that this could be a life saver. Thanks for sharing! Great advice! I’m going to have to try some of those products. I have the same problem with my skin getting so dry, so thank you for sharing your routine! I’m obsessed with your bathroom decor, by the way!! Your bathroom is so beautiful. I will definitely have to check out these products!! Great products! I was wondering what you had on your legs the other day, the sheen was amaze! Photoshop is AMAZING, isn’t it?! I’d love to try the honey revitalizing body butter! Thanks for sharing! I’ve never heard of body water but it sounds amazing! Great routine!! PS I’m doing a giveaway!! I always love finding new skincare products… Definitely will have to try the hand cream. Beyond obsessed with your bathroom! About to decorate my new condo in Miami and am looking for all sorts of inspiration :) I might need that bar cart in my life… Thanks for sharing! your skin is so flawless! can’t wait to try. and that robe looks so comfy and perfect for summer! My skin is super dry right now too! Do they have anything for feet? Cute post! Your bathroom is gorgeous! LOVE Lake powell! It seriously is the best little break but I definitely understand the dry skin. In and out of the water all the time and in that hot sun, it definitely pays a toll! Will have to try some of these products, thanks for sharing! Wow your bathroom is gorgeous! Your home is so stunning! What camera and lens do you use? Your photos are always so beautiful! Your home is so pretty! Great review! These products sound amazing. I love the chandelier in your bathroom! These photos are gorgeous and the products look amazing! Love that you’re sharing your skin care routine! I recently got my face routine down, as I’ve finally found the products I love! My body is a whole other story & I’ll definitely have to look into some of these Perlier products! i know these products! love the smell and how moisturizing it is! I definitely need to try this stuff! Absolutely great skincare routine, and I may need to try these skincare products out, my skin is always so dry! I love the gold and white accents in your bathroom! 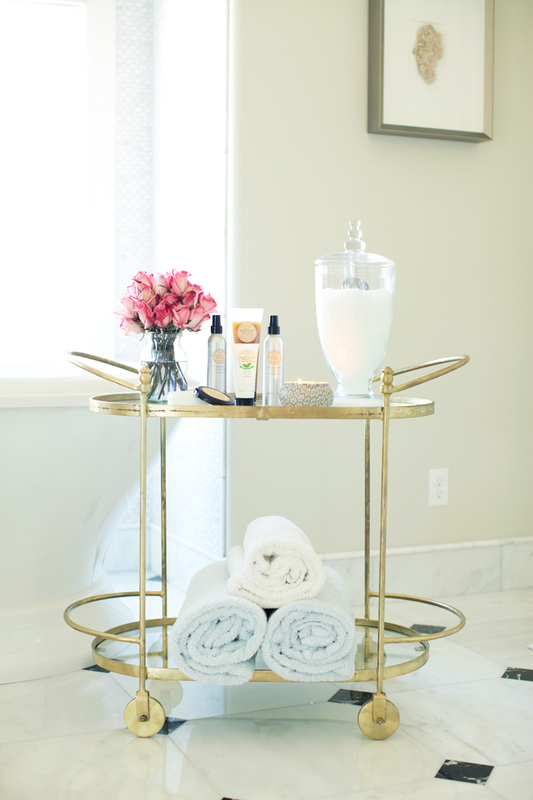 I have a similar, smaller, little side table next to my bath and I love displaying lotions, candles, and towels! Stunning pictures! Such a great post! Your home is beautiful! You have such nice skin, thanks for sharing your routine! I’m 21 and just started a blog of my own! Could you please check it out? Great post! I will have to take a look at their line soon! Please proofread your posts. There are so many grammatical errors! You used that several times when you should have used “its”. I love your bathroom. I will have to try those products. Gosh your bathroom is just incredible! I wish mine looked like that. Hope you had a wonderful family vacation! I love your bathroom. Absolutely gorgeous! Your bathroom looks so gorgeous! I want to try all those products! I’m a bath product junkie and everything is just so lovely! 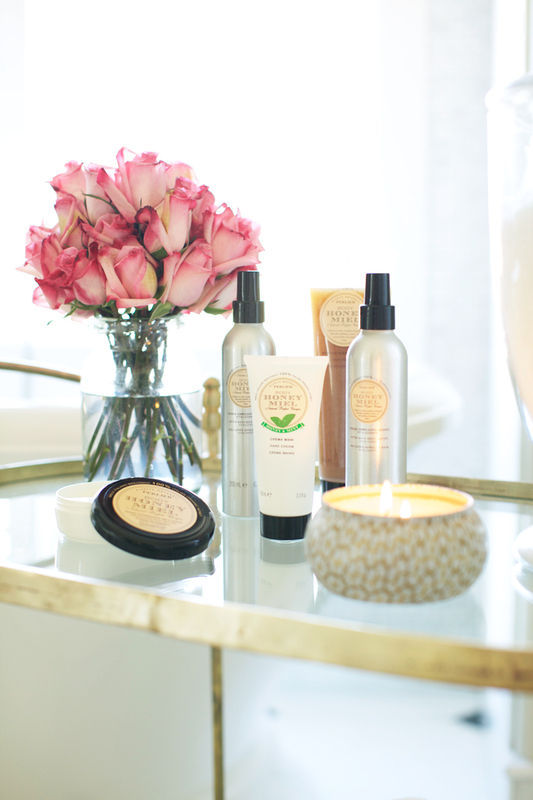 Your bathroom is lovely and these products sound amazing! What happened to Biore, Jergens and La Mer? Still love and use those too! I love that there are so many awesome products out there! Such gorgeous photography here! Is that taken at your house? If so, I’m sooooo jealous:) Have a great week! I’m dying at how beautiful your bathroom is! Love Barefoot Dreams as well! Your bathroom is so glam! LOVE it! Is that a huge jar of bath salts!? How amazing! LOVE your bathroom! I’d never heard of that brand before but the packaging is lovely. Your house looks so beautiful! Great Post! Great Post! What bath salts do you use, and do you like them? I use Epsom Salt in Lavender :) Such a pretty scent and so relaxing! This looks wonderful. Is Perlier cruelty free though? Thanks for sharing! Definitely going to be trying this out. I just ordered the after bath body water and the body butter and can’t wait to get them! Just wanted to let you know that I had the exact same candle and I let it get down really low thinking it would burn out by itself but instead the WHOLE TIN caught on fire. I love those Anthro candles but I’m sticking to glass now. What!! Scary! Good to know not to let it burn out, thanks for the tip! Where did you get your robe? I got it from Nordstrom. There is a link in the post below the last photo. Beautiful bathroom. Please share sources for the bath tub and cart. You have such a beautiful and inspirational blog. Do you happen to know what brand your gold cart is?!!? (I always check on One Kings Lane too late and the item is already sold out… I would love to search for it elsewhere). Also, are those blankets on the bottom of the cart or towels? Do you mind sharing a brand/source and colors? Thanks so much! Unfortunately I don’t know the brand of bar cart. I actually found this one by searching brass bar cart on google. Maybe you’ll find the same one or similar style by doing that. I hope you find it, good luck! They’re towels and I got them from Pottery Barn outlet about 4 years ago. Also, I can’t believe how ridiculous people are about you trying different products. I have about six different face creams in my bathroom right now. I’m glad to hear I’m not the only person who uses more than one face cream! Thanks so much for reading my blog!